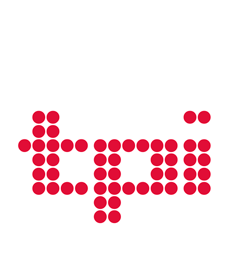 TPi spoke to some of the biggest names in the industry to get the latest tech and backstage news from the iconic festival. Once again, Green Hippo had a strong presence at Glastonbury. 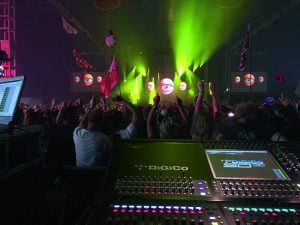 Perhaps the key difference between events at Worthy Farm and the multitude of other events featuring Hippotizer worldwide is the involvement of Green Hippo’s Head of Training, Simon Harris. 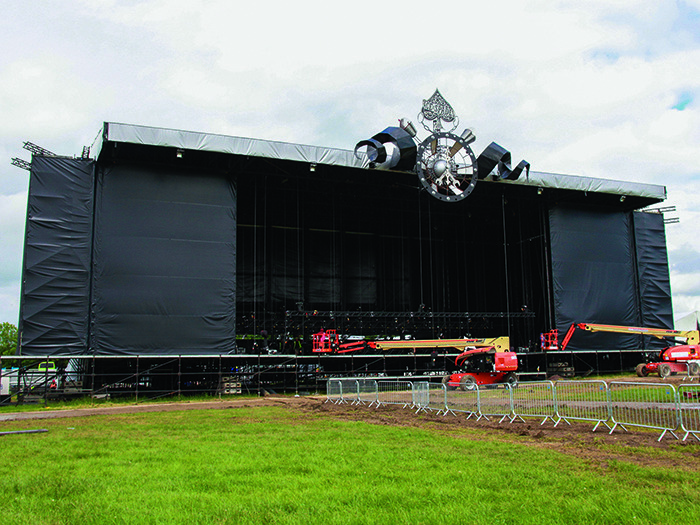 Harris has treated Glastonbury’s John Peel Stage as his annual hands-on project for many years. Having formed a strong bond with Cate Carter of Bryte Design, this is his ninth year running servers on the popular stage, renowned for showcasing up and coming bands from around the globe. John Peel 2016 presented some very real challenges this year. The design has previously been driven primarily by the concept and the initial discussions. However, the popularity of the stage has led to a raising of the bar for the daily headliners, which, in turn, has dictated the video requirements and its final implementation. One artist specified a very high resolution, 16:9 screen whose dimensions and rigging requirements dictated that it must remain in-situ for the entire festival. Whereas previous years have seen video columns and similar creative concepts, this was not possible this year. The continued diversity and varying degrees of technology that the bill on John Peel fires at the crew running it led to the first deployment of a pre-programming Hippotizer suite in the backstage area this year. Visiting LDs could quickly check what their live performances could look like before sending their preferred looks to FOH even while other artists were performing. This not only helped with the unusually short turnaround times on the stage, but also increased the levels of creativity on display throughout the weekend. Elsewhere, Hippotizer, once again, was the default choice of server on the West Holts stage supplied by Darren Parker’s team at DPL. The Glade Stage had Green Hippo servers supplied by Colour Sound Experiement. As usual, many visiting artists passed through the festival site with their own Hippotizers in their touring rigs. These included Jess Glynne, Two Door Cinema Club, The 1975 and Chvrches. VME provided sound and lighting for the Beat Hotel. This was the second continuous year that VME were involved with this stage, providing sound, lighting and site power distribution for the 2,000 capacity bar stage. 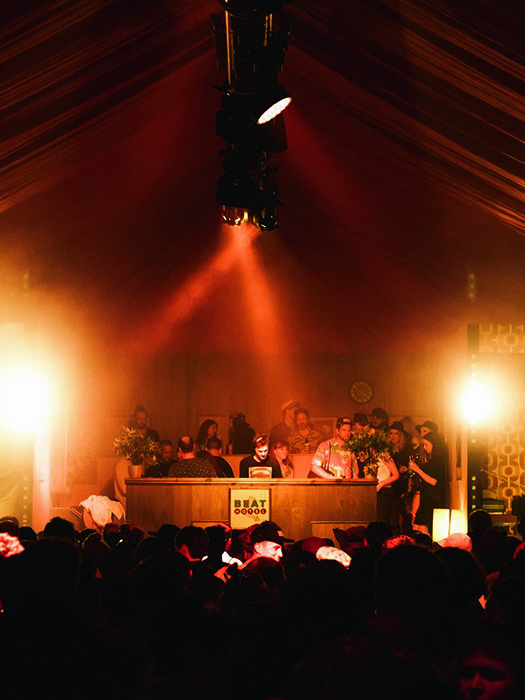 The Beat Hotel has DJ’s playing music continually from 10am through through 3am, with headline artists across the event including Heidi, Seth Troller, Midland, Ben UFO, Joy Orbison, Four Tet, Floating Points and Simian Mobile Disco. Designed to mimic a cheap, sleazy and unsophisticated American ‘70s motel, the Beat Hotel consists of a complete stage set, built by the team from Gorilla Events. A combination of Showtec Sunstrip Active DMX, Chroma Spheres, Robe LED600 Wash and Robe 100LED Beam fixtures were then used to light the stage set and marquee. Lighting control was an Avolites Tiger Touch, programmed by VME’s Ben Hyman and operated by Carl Palmer. At the audio helm was Jim Loasby, who utilised a range of Kling & Freitag loudspeakers to cover the venue with sound effectively. K&F Line 212, SW215, Scena and Gravis loudspeakers were deployed both inside and outside the venue, powered by the new Kling & Freitag PLM12k44 amplifiers and controlled by a Yamaha CL1. The jewel in the crown of Clarke Cable’s year was its involvement with the spectacular Arcadia Spider. From an initial introduction while exhibiting at the Prolight+Sound Show in April this year, Clarke Cable supplied over 8kms of bespoke power and signalling cable for the structure. At the heart of the project was the combined Clarke Cable Socapex Power & DMX cable that was initially designed for pre-rig Truss. This ‘one cable’ solution carrying six power circuits and continuous DMX was customised to fit within the legs of the structure and the underbelly of the central pod. This dramatically cuts down the rigging time during the build of the structure by 70%. From design to delivery of 72 line items, this remarkable cable structure took just three weeks to complete. All the cables used were jacketed in Polyurethane to withstand the hazards of potential spillages of Bio Fuel, Hydraulic Oil and the ravages of water ingress (Glastonbury would not be Glastonbury without rain!) The entire cabling system allowed Arcadia to be tour-ready post festival and be totally self-sufficient. Over at the Pyramid Stage, Clarke Cable’s Socapex Power & DMX cable was deployed for the first time at a major music festival. Deployed within sections of Pre Rig Truss this facilitates huge time savings when rigging or interchanging the luminares. Each cable provides six power circuits and the attendant DMX signal routing to control six luminares in a single flexible light weight cable. Jacketed in Polyurethane it has elevated protection for the ingress of water and is immensely tough compared to standard rubber cables. You get all the features of an Internally Wired Bar but in a flexible single cable solution. Over the years, lighting technology has pushed the boundaries but the cabling has remained the same, now Clarke Cable has introduced its technology to keep pace with the changes. On the audio front, Clarke Cable’s bespoke speaker cabling systems were again in evidence. Designed for the Martin Audio Mini MLA series these IP67 multiway solutions deliver eight bi-amped, high-end signals from their sub bass unit to four satellite speakers. At the hub is Clarke Cable’s IP67 Y Splitter technology that delivers a ruggedised waterproof plug and play solution. This is just one of the products Clarke Cable custom builds along with power distribution boxes, and waterproofed Socapex Spiders for the Martin Audio Multi-Cellular Loudspeaker Array. 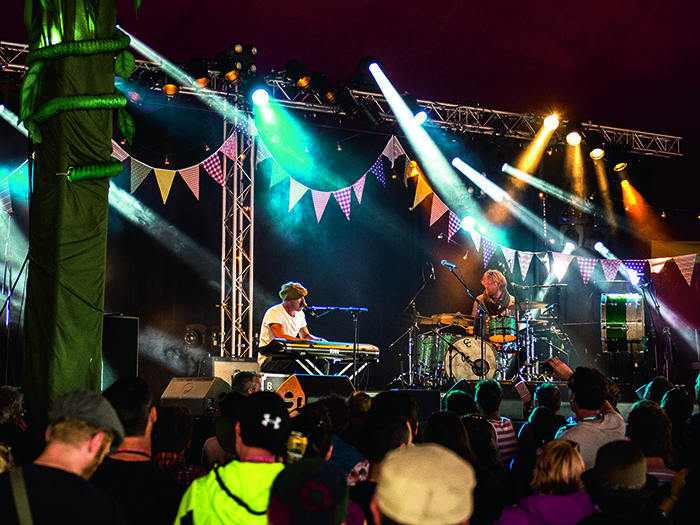 Often described as a ‘festival within a festival’, The Field of Avalon at Glastonbury has built a passionately loyal following with its comfortable mix of folk and roots music, wholesome food and communal vibes. This year, that welcoming atmosphere was enhanced by warm and engaging lighting, thanks to a carefully crafted setup by GLS Lighting that used a collection of Rogue and STRIKE 4 fixtures from Chauvet Professional. The GLS team, headed by Wil Thomas and John Curtis, flew 12 Rogue R1 Beams, eight Rogue R2 Washes and eight Rogue R2 Beam fixtures on the upstage truss. The R1 Beams were selected for their incredibly punchy beams, which are extremely bright despite their compact size. This allowed the LDs to use the powerful reach of the beams to their full extent shooting far into the crowd, while also adding endless looks thanks the fixtures’ gobos and prisms. As two pockets of the tent housing the Avalon Stage were exposed during the day to sunlight, one of Turner’s key considerations was ensuring no show atmosphere was lost for the performers playing during the day. In adding the Rogue R2 to the arsenal of lighting fixtures on the Avalon Stage, Thomas and Curtis had both a practical tool for the daylight hours, and a secret weapon for the evening. In addition to the collection of Rogue fixtures, the GLS team deployed STRIKE 4 fixtures positioned on above stage and side stage truss, ushering in a much larger stadium feel to the relative intimacy of the 3,000-capacity stage. The STRIKEs provided blinding, warm white wash and strobe effects. Depending on the situation, GLS was able to create intensity with the blinder effects or atmosphere with the low level tungsten effect glow. The combination gave the artists on stage some classic looks upon which to get the crowd going at key moments in their sets. From a technical standpoint, the GLS team were appreciative of the smooth dimming curve of the STRIKEs. “Not only is the STRIKE practical in the sense that the fixture essentially gives us three different functions in one, we don’t need to carry cumbersome dimmer racks: a huge advantage for the festival setup and de-rig,” Thomas said. Turner concluded: “The Avalon Stage has a truly credible reputation within the greater confines of Glastonbury, and as such we saw it as our duty to give the crowd, the performers and the Avalon organisers the most impressive lighting display we could create within the means we had. The year 2016 marked the 18th successive year that Eat to the Beat (ETTB) has provided the backstage catering for artists and crews at Glastonbury. Once again Mary Shelley-Smith, ETTB’s Global Operations Director, was responsible for overseeing the process – a role she has undertaken since ETTB was first awarded the contract in 1998. 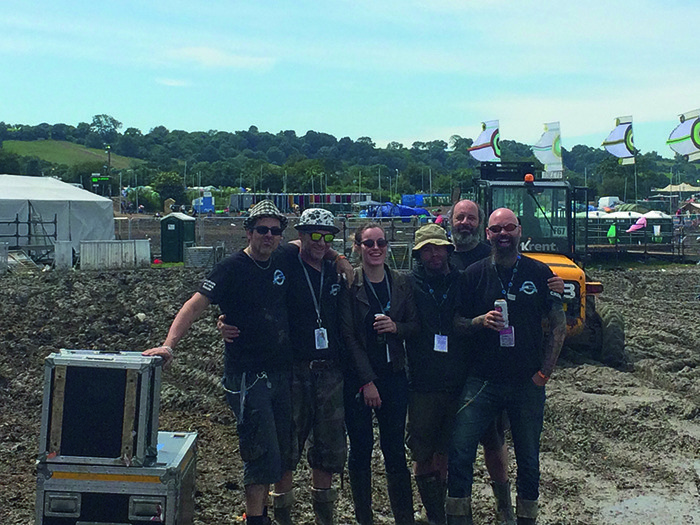 Shelley-Smith and her team had the responsibility for keeping crews and artists fed and refreshed – not just during the festival but throughout the all-important build-up phase, and were on-hand afterwards while the site was cleared. Thanks to its vast Glastonbury experience, ETTB has a meticulous operational plan that is implemented for the festival. Initially, a 10-strong team arrived on site on 5 June to live and work in the compounds of power supplier, Aggreko. This team remained on site until 6 July providing catering for up to 100 electricians and key production workers each day. Ahead of the festival, ETTB cranked up its operation by creating a field kitchen within a huge marquee with a dining room to provide catering for crews and artists working on the main two festival stages, Pyramid and the Other, and the BBC TV and radio broadcasting crews. ETTB brought its own equipment onto site, which even included sinks and hot water provision. A further 50-strong team supported by numerous volunteers served breakfast, lunch and dinner to 950 people each day. Over the main festival days ETTB served more than 13,000 meals. Around 20 chefs provided a 24-7 service with full cooked breakfasts, hot lunches and salad bars, a deli selection and homemade cakes. Lunches were three courses with lots of choice to suit every taste. A critical part of ETTB’s service is ensuring there were balanced, wholesome meals for everyone – taking into account allergies, intolerances or special requirements. Shelly-Smith’s team included supervisors responsible for key areas: Lyn Smith, Inter stage; Neil Holmes, Other Stage; and Heidi Barry, Pyramid Stage. In one of the must-see performances at Glastonbury 2016, an orchestra, conducted by Charles Hazlewood, performed composer Philip Glass’ Heroes Symphony at midnight on the Saturday. Filling the sky with an array of beautifully choreographed lasers, a display designed by artist Chris Levine accompanied the classical piece. Based on Bowie’s iconic 1977 album, Heroes Symphony was performed by members of the British Paraorchestra, a professional ensemble of musicians with disabilities. The sonic laser show was created by Levine in collaboration with Peter Hampel of Edenlab. 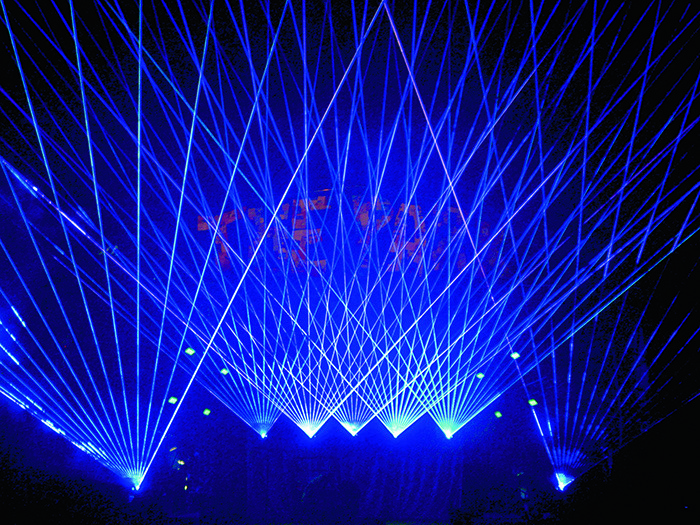 Award winning laser specialist, ER Productions, brought Levine’s laser designs to life using a combination of high-powered OPSL lasers to create an ethereal display of geometric light forms, which complemented the highly sensory musical composition. 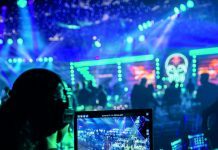 ER has created show-stopping laser displays around the world for recording artists ranging from Kylie to Queen and at events including the 2012 Olympic Games. To achieve the look, ER rigged Excellent 21 laser heads on the upstage truss focussed over the audience, while three single colour red lase-arrays sent triangular beams across the stage creating a focal point. During the pre-programming stages at the ER facility in Dartford, the decision was made to operate the final movement and most dynamic part of symphony live. With versatile live operating capabilities, Pangolin Beyond 2.1 operating software helped to create a very powerful finale. Midi controllers enabled Levine to control various elements of the show. Responsible for programming and operating the display, ER Productions’ Project Manager, Andrew Turner, said: “Having collaborated with Chris in the past we knew that this project would be something out of the ordinary. In addition to the red Lase-Arrays and Excellent 21’s, we created the swirling nebula patterns Chris is renowned for by projecting 18WRGBB OPSL lasers through Lumina glass. 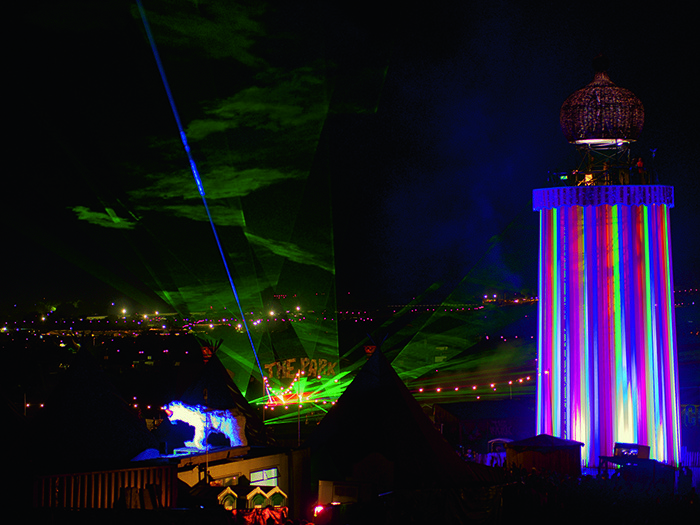 The beam quality and colour mixing of the lasers we used is second to none, making them perfect for a large outdoor festival like Glastonbury. Backline supplier Music Bank has been an official supplier to Glastonbury’s stages for 22 years. Manager, Jimmy Mac, laughed: “I’ve done 21 of them!” This year it provided 40 separate backline packages on site; a mix of generic backlines for stages and specific artists. The 2016 stages that benefitted from the company’s equipment include the Pyramid Stage, the Other Stage, Shangri La and Williams Green amongst many others. Artist clients included Editors, Coldplay, ZZ Top and ELO to name but a few. Continued Mac: “We are still a small crew but all of our staff are Glastonbury veterans. This year I had four crew who have amazing knowledge on the huge amount of backline we carry. Once the gear has been prepped in our shop, the main part of the job on this festival is checking off the backline from artic to satellite vans and delivering it to stages. We constantly get calls from artists, who arrive without a certain bit of kit or discover something they have brought is not working. Some requests seem a little strange and range from plectrums to full size concert grand pianos (both of which we managed to source!). At the end of the day, we’re trusted to supply the highest standard of crew and backline here because we’re tried and tested for a very demanding job – it’s no wonder the Music Bank catchphrase is ‘Experts in your Fields’. Martin Audio’s premier systems took over an unprecedented six stages at this year’s Glastonbury Festival – including the main Pyramid Stage where it has operated with RG Jones Sound Engineering continuously since 2008. 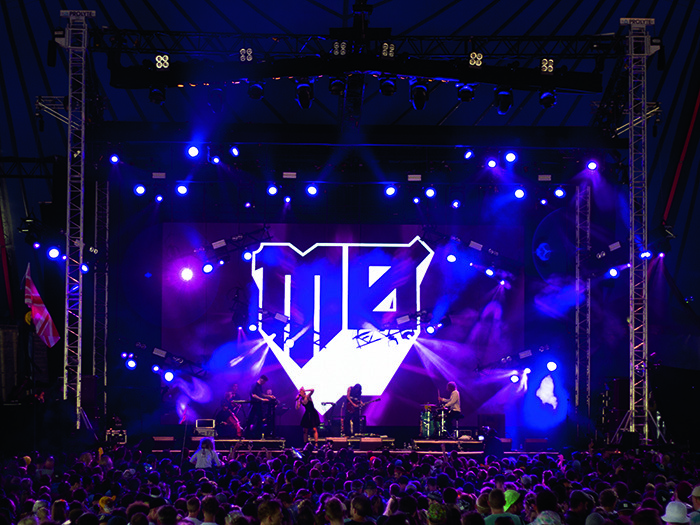 The award-winning MLA technology could not only be found at Pyramid but also John Peel Stage, West Holts and Block9 complex, while conventional Martin Audio line arrays featured at The Park and Billy Bragg’s Left Field stages. It was the proven ability of the MLA system to contain sound and prevent bleed, as well deliver high octane sound where it was needed, that had urged the festival’s production team to specify it on other stages. Aside from mitigating sound overspill, it would compensate for a slightly revised layout at the Worthy Farm site, notably the re-angling of the John Peel stage towards Pyramid. A key member of the production team was Simon Honywill, who was this year employed direct by the festival to oversee the safe deployment and delivery of the various MLA systems by production specialists RG Jones Sound Engineering and SWG Events. Martin Audio R&D Director, Jason Baird, paid tribute to the rental companies, the various system techs and their own support team, headed by the experienced Chris Pyne. “There is no doubt that Glastonbury was a major success. We met the challenges of propagation across three new stages in difficult atmospherics and achieved a greater reduction of noise spillage, as directed by the acoustics consultants, without losing sight of what we needed to achieve on the Pyramid stage. One of these was veteran sound engineer Gary Bradshaw, who mixed Jeff Lynne’s ELO in the Sunday ‘Legends’ slot. Speaking of the experience, he said: “These days you expect to be able to turn up to a gig, patch into the PA and with very little adjustment be able to produce a show. I have used Martin MLA several times recently and that has certainly been the case with this system. At Glastonbury there was no adjustment at all from me — my output EQ on the main left and right and sub-low were all flat and the result was a very warm, powerful array. RG Jones kept largely to the successful formula they have employed since transferring from Martin Audio’s W8L Longbow to MLA. The system this year comprised 17 MLA (and a single MLD Downfill) for the four main hangs and a total of six delay positions of both MLA and MLA Compact. One change this year was the transposition of MLA and MLA Compact on certain delay rings, which brought an overall improvement to the time alignment and distribution. As a result, delays one and four were formed from 16 MLA Compact, delays two and three utilised 14 MLA and delays five and six were equipped with 10 MLA. There was also a broadside cardioid array of 21 forward-facing (and 10 rear-facing) MLX subs across the width of the stage. Finally, four MLA Compact were deployed on each side of the Pyramid arch for stereo infills. With overall Project Manager Ben Milton supported by Matt Sussex (who was also West Holts Crew Chief), Mark Isbister was responsible for pre-production and system engineer Mark Edwards, supported by Jason Baird, took charge of the PA rig. Milton also oversaw FOH along with Damion Dyer, while down at the stage were Becky Pell and Jack Bowcher on monitors. Stage Engineers were Dan Molsey and Sam King. With repositioning and reorientation of the John Peel Stage towards Pyramid, and consequent concern about overlapping sound, festival production specified that MLA should be used. With system training delivered by Simon HonywilI back in May, and Chris Pyne supervising the set-up, both men reported a sound which fulfilled all objectives. Production hung 12 MLA Compact and stacked six MLX enclosures per side, with one MLX facing backwards on each side. “The power behind the bottom end was phenomenal, the clarity amazing,” stated Honywill. SWG’s head of operations (and technical production manager) Mark Bott was equally effusive. “Our brief was to reduce any impact on the Pyramid stage and MLA was absolutely the right system for the job. “We had listened to the product in detail and it was fantastic and offered a lot of important control tools. We have a duty of care to the festival and by the time we got to Glastonbury knew MLA Compact’s capabilities, despite its size. It’s an amazing rig. RG Jones flew two 20 MLA Compact elements per side with 16 MLX in a cardioid broadside array. RG’s employed three West Holts regulars to oversee monitors, FOH and patch, in the form of Rob Ritchie, James Clark and Martin Shaw who complemented their own Sam Liddiard and Matt Sussex. 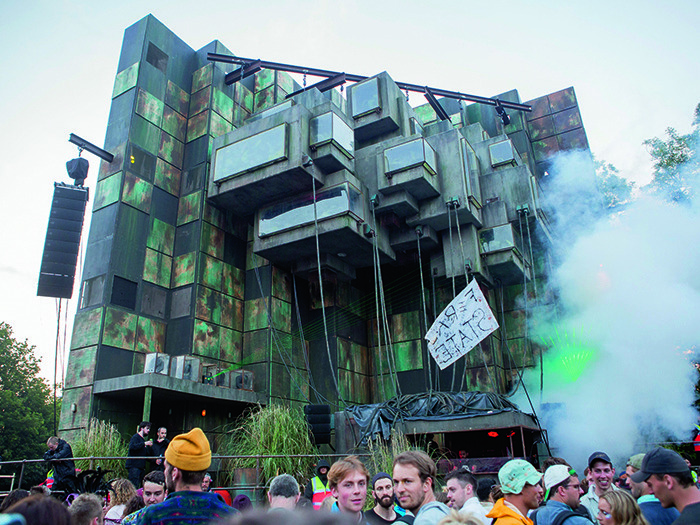 Block9 represents a major part of the late night festival ambience, based around three unique, stageset-like structures: Genosys, London Underground and NYC Downlow. Because the brutalist Genosys – open-air and 60ft high – runs until 6am, sound thresholds have been historically reduced to a mere 88dB, hardly ideal for EDM. Dispensing with the ground stack point source used previously RG Jones flew 10 MLA Compact a side, nine metres off the ground and angled down, with the flyong opints integrated into the Genosys structure. The subs were built into the set, with six DSX either side of the DJ booth in a curve, plus a stack of MLA Mini either side provided infills. SWG Events has handled this stage since its inception in 2007, using the Martin Audio W8LC and also providing lighting. This year was no exception. 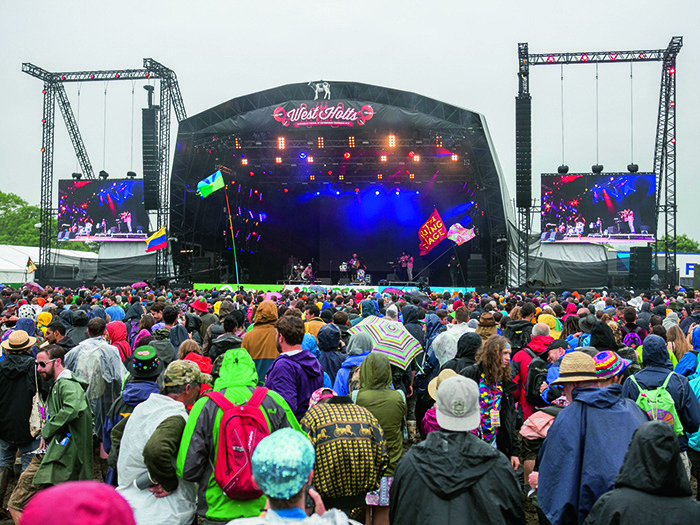 The Left Field Stage is largely a political forum dedicated to activism and social justice, overseen by Billy Bragg – but the sound system also has to cater for loud music. This was familiar zone for SWG Events, which deployed eight W8LM Mini Line Arrays per side, along with WS218X subs. “The versatility of the Martin Audio system always serves us well because Left Field is a mixture of speech and music taking place in a large tent. It’s all about intelligibility, although at the same time we had Enter Shikari play through the system last year!” said Mark Bott. 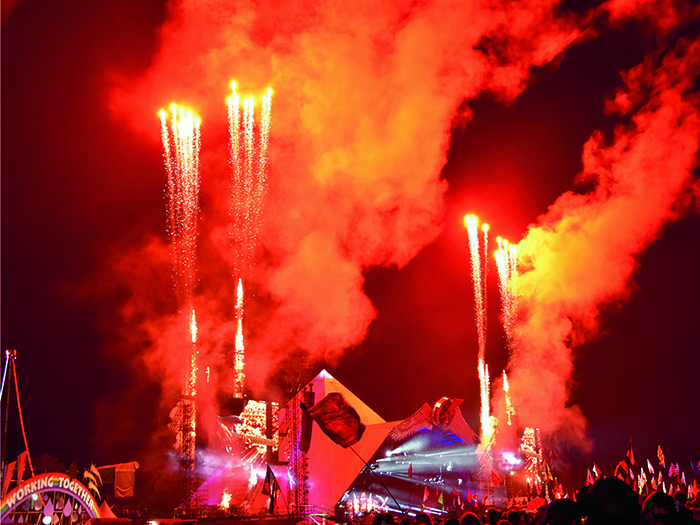 Director of RG Jones John Carroll added “We are very honored to be trusted with three major stages at Glastonbury Festival, including the iconic Pyramid Stage which we’ve been consistently involved with since 2008. The unprecedented skills of our engineers matched with the unparalleled support from Martin Audio has produced results that just seem to get better each year. The company celebrates 90 years this year and Glastonbury Festival is definitely up there with our finest achievements”. And finally, an honourable mention goes to Chris Pyne for services beyond the cause – walking a constant relay between the John Peel and Pyramid stages, often in the rain, which according to his Fitbit took him 54 miles (although Honywill would argue that this was easily eclipsed by his own perambulatory achievements over the week-long duty cycle)! Alongside the 60 stages and structures it installs yearly across the site, Serious Stages was also tasked with designing and building the BBC media structures for the first time. This included the bespoke 12.6 metre by 17.4 metre media studio situated within The Park. The media studio featured an apex style roof, two sets of steps, handrails and clear sheets surrounding the broadcast platform. With a perfect view over the festival site, it housed a variety of BBC presenters throughout the event. Serious Stages has been working with the festival for over four decades, supplying its most iconic structures, including the decking and camera runs for the Pyramid Stage, newly designed and built West Holts, the Other Stage and Park Stage. Serious also supplys the Temple and the Ribbon Tower, plus multiple indoor stages, media platforms, television camera towers, PA towers, spot pods, structural supports for video screens, viewing platforms and arches. Simon Fursman, Project Manager at Serious Stages, commented: “We’ve been working with Glastonbury Festival for over four decades, supplying the world famous festival with most of its stages and site structures. This year has been the first time we have worked directly with the BBC to design and build a bespoke media studio, complete with a presentation platform that overlooked the entire site and the camera tracks at the front of the stages. The studio was timber clad and provided an interesting environment for broadcast and media interviews and for artists to be filmed in, whilst our proprietary decking and flooring systems provided a stable base for broadcast equipment. For this year’s event we enhanced the West Holts stage, adding goalposts to hang screens which opened the performances up to a bigger audience and made the stage much more visual. We also made a few modifications to the Other Stage, and supplied all of the other main stages, such as the relocated John Peel stage, the bespoke structures like the Ribbon Tower along with the associated front of house positions, VIP and assisted viewing platforms. “We’ve seen the stage grow in every aspect. This year we enjoyed a change of location, moving us up the hill to a larger site in the northwest corner,” she said. Led by Area Organiser Jim Fox and Production Coordinator Phil Tickle, the stage has evolved over recent years but throughout this process the design brief has remained similar. “Each year we need to create a performance space that works for every artist, and ensure the stage looks great for both the festival audience and on the BBC coverage. The video design saw the biggest change this year, with us moving away from using low resolution video elements to create textural effects and instead having a large upstage video wall to meet specific artist requirements. “In order to accommodate the large video wall and a number of other special additions on our modestly sized stage. Phil redesigned the ground support (supplied by Rigging Services) to carry the additional five tonnes of LED screen, Kinesys motors and lighting pods. The new screen design was a ROE MC-7, supplied by PRG XL Video. It posed some challenges as it almost entirely filled our upstage wall. To break this up, we chose six lighting pods on Kinesys motors that could be set to different positions either in front of or above the screen, allowing artists to use the space as they wish. We had full support from Green Hippo, with Simon Harris onboard to setup and manage the brilliant Kast V4 server, assisted by Kate Perrin. 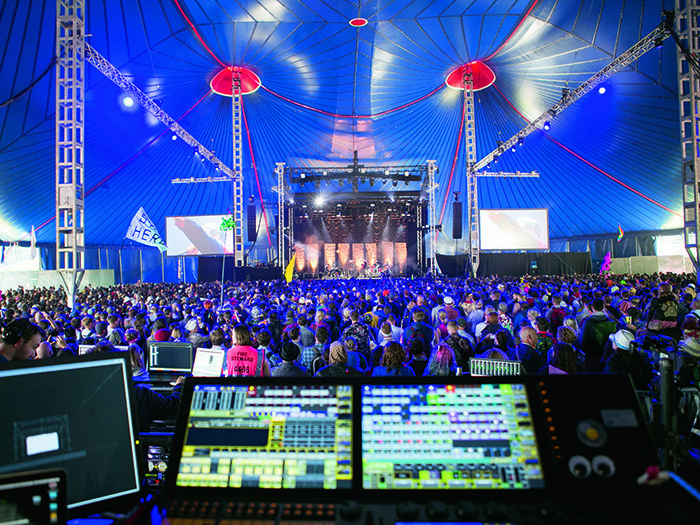 System design and build was managed by Vortex Events, who supplied crew and operators for the festival system and behind the scenes Paul Maddock-Jones managed the IMAG and broadcast systems. “Gary Churchill and his team from IMAX supplied all the lighting for the stage with support from both Ambersphere and Martin by Harman. This year we had Martin by Harman Viper Air FX fixtures on the rig, which proved to be a hugely versatile fixture in the festival environment, and we used the new Atomic LED strobe for the first time. We were really impressed with the Atomic LED, it makes a great replacement for the original Atomic strobes, the backlight effect looked fabulous on camera and it’s so much more energy efficient – a key design consideration when working for Glastonbury festival. We used the new Clay Paky Scenius for key lighting and found the true white lamp source meant this was the perfect choice for the job. We had a full compliment of MA Lighting grandMA2 consoles at FOH for control with the Dot2 console in place to control all TV key lighting and audience fixtures. We’ve been pleased to be able to offer wysiwyg to all guest LDs with four stations at FOH allowing multiple programmers to work simultaneously. 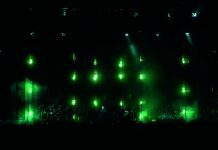 For the second year in succession, VER was contracted by the Pyramid and Other Stage production team of Yasha Morgenstern and Emma Reynolds at Glastonbury Festival to work alongside their video production coordinator Jay Ellis of Production Network. VER provided the Winvision 9Air LED screen as main camera IMAG screens for both main stages, along with installed screens onstage to be used with associated control equipment for a variety of artists. The Other Stage made full use of a VER 9Air 14.4 x 4.2 metre rolling screen, supplied in sections that could be easily moved in during band changeover to be up and running in multiple different configurations, in under 10 minutes. The flexible nature of this screen allowed re-configuration into a single large flown screen for Sunday night headliners LCD Soundsystem. An additional VER supplied, smaller, flown 9Air screen was also added to the line up for New Order on the Saturday. VER had a clean sweep in five mm LED Display systems for this year’s Pyramid Stage headline acts, supplying Revolution RS5 via Video Design for Muse on Friday with Everbrighten BR5 supplied directly to the act for Adele’s Saturday performance and via Glastonbury Production for Coldplay’s Sunday night set. Installed as a huge 15m x 8.5 metre with a 2640 x 1496 resolution, controlled by multiple VER Revolution M2 processors with the incoming signal seamlessly split using Datapath X4’s, the BR5 also gained further exposure in multiple configurations throughout Sunday for a number of major acts including ELO, Beck and Ellie Goulding. Ahead of the weekend headline shows, the screen was built in full, ready for Adele’s Wednesday rehearsal and masked to a curved shape for her set. VER also provided six Barco 2k40 video projectors and associated control equipment to take care of the huge projected images that flanked Adele’s Pyramid Stage performance. Helping minimise the impact on the busy production teams, the system was then re-mapped to use the full screen during the overnight changeover ready for Coldplay on Sunday. Assisting with the essential infrastructure of the event, VER also supplied Production Network with all the necessary fibre optic signal interfaces required to move video signal between FOH, stage, video cabins, screens and projectors on both stages. A total of 40 fibre optic circuits in DVI and HDSDI, plus over 10km of fibre was supplied for this alone. Rounding up the show Alastair concludes “Hard work over the last couple of years is now paying off, with VER seeing a huge demand for it’s services. It’s brilliant to be working at the peak of the industry on huge projects like Glastonbury – and to be appreciated for what we can deliver!”. As New Order, one of the most critically acclaimed and transformational new wave bands of the 1980s took to the Other Stage, creative technical production expert Hawthorn was on hand to support them, providing lighting and video equipment for their performance. The company was tasked with providing lighting equipment to augment the existing festival rig. The specification included Martin by Harman MAC Viper Profile, Clay Paky Sharpy and ETC Source 4 Profile fixtures, all controlled using an Avolites Arena lighting desk, a console well suited to the larger production demands posed by a music festival. The band’s rousing performance was further enhanced by Hawthorn’s stock of Glux 10mm LED panels, which provided the canvas for stunning visuals of geometric shapes and wormholes. 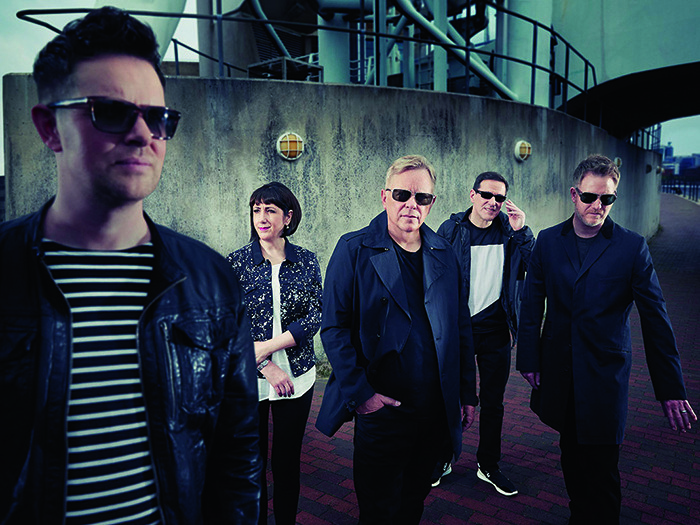 Hawthorn’s ever-growing reputation in the concert touring sector has already seen them supply kit and crew for a host of performances this year including those by influential ‘80s new wave group, OMD (Orchestral Manoeuvres in the Dark) and Steven Wilson’s Hand. Cannot. Erase. 2016 World Tour. Glastonbury was the second of the band’s 11-date European Festival tour, which kicked off at Sonar Festival in Barcelona and will conclude in September at Lollapalooza in Berlin. 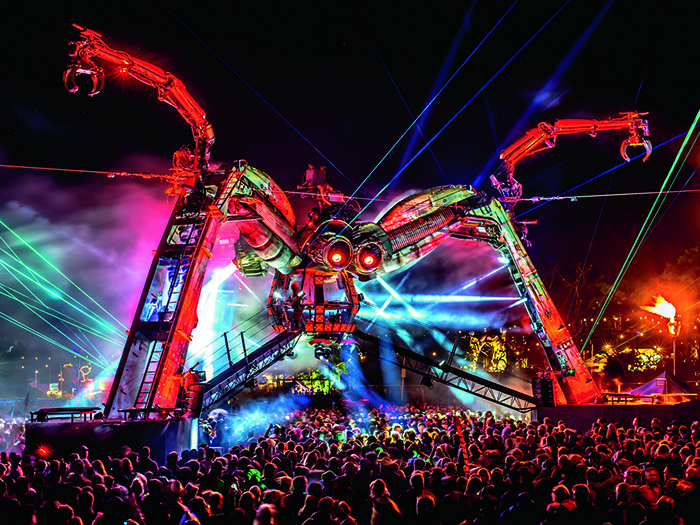 The architectural division of Robe, Anolis Lighting, has recently worked closely with Arcadia Spectacular’s technical team in the run up to Glastonbury to illuminate its technically acclaimed Spider. 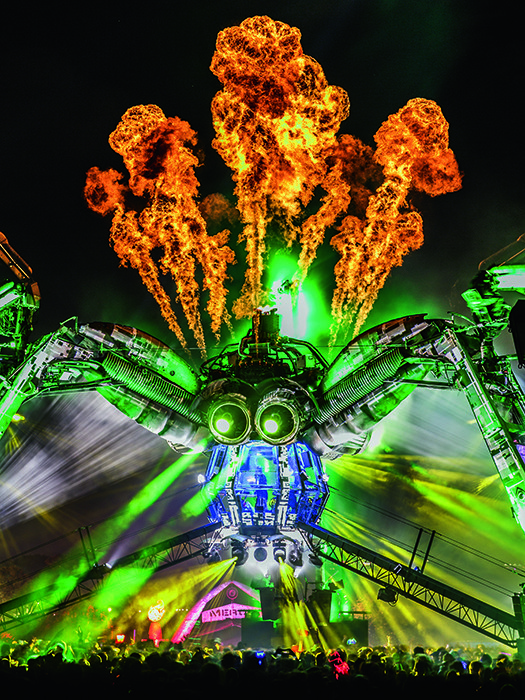 Arcadia’s main challenge was to create a new efficient LED lighting system to illuminate the structural elements of the Spider that would outperform its existing system. In order to do so, it had to approach the lighting design from an architectural perspective as opposed to previous rock ‘n’ roll methods. Having successfully worked with Robe for many years, the Arcadia team naturally turned to Anolis to find the best solution. The fixtures chosen were selected primarily based on their performance, reliability and robustness; features that are key elements from the Anolis outdoor colour-changing range. Due to the complex nature of the structure, a carefully planned system, designed by Tim Smith of Arcadia in collaboration with Simon Gooding of Anolis, was put in place to enable all of the lighting fixtures to be positioned in a way to be removed and transported easily as it is a touring system; all of that combined with an effective cable management system, all powered from the Anolis range of power supplies. The Spider’s legs were all illuminated with the ArcLine Optic Double Outdoor linear range, which utilises high LED output and controlled optics. The three moving cranes on the top of the structure had previously proved to be a challenge to illuminate, which is why the ArcLine Mini Outdoor linear were chosen due to their small profile and open optics which was ideal in order to make the cranes stand out during the performances. The main body of the Spider was lit with the compact ArcPad 48 Integral flood light, positioned all around and fitted with wide optics and barn doors to highlight other elements of the structure. Finally, more ArcLine Mini Outdoor linear were installed inside the DJ booth where space restriction was a challenge yet high output was required. All of the linear fixtures were individually powered via 10 of the Anolis ArcPower 384 Rack-Mount drivers controlled by their Art-Net interface. 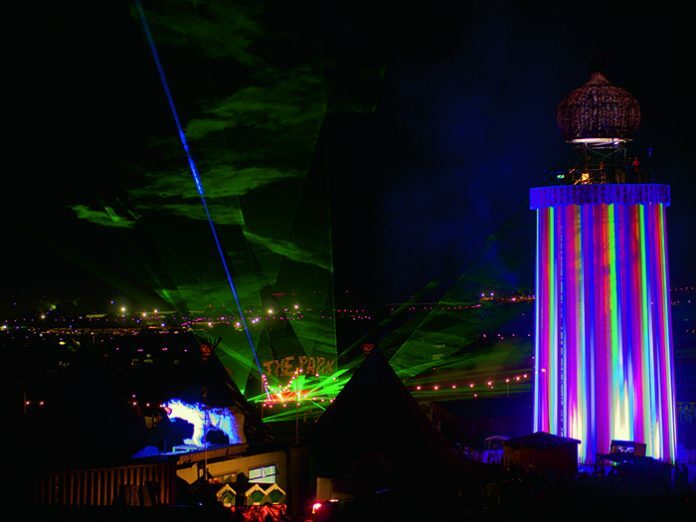 Aurora Lighting Hire once again headed for Worthy Farm in support of Lighting Director Oli Richards, Associate LD David ‘Frankie’ Francis and Gaffer Sam Madden as Broadcast Partners during the BBC’s extensive coverage of Glastonbury 2016. For the main studio area the LD’s chose Mole Richardson molefays to add some tungsten warmth along with an array of tungsten festoon that helped complete the festiva- friendly look. For a little more power, colour and versatility Martin Rush PARs were also included in the installation. Aurora also supplied LED ribbon which was been woven into the set design for a bit of extra magic. To meet the need for portability and ease of use, Bi-Colour Lite Panels were despatched, the kits proved particularly useful in ad hoc interview situations where a quick set up is essential. Meanwhile, for studio guests a mixture of Tungsten and Daylight Fresnels augmented with 4ft 4bank Kino Flo and Parabeams completed the festival line up. 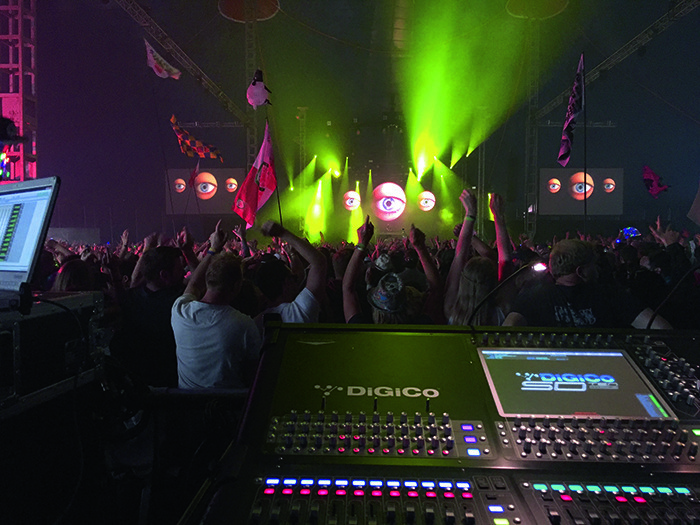 Avolites’ lighting consoles, dimmers and media servers have once again delivered robust, festival-proof performance to astounding shows across Glastonbury’s vast and varied musical programme. For nearly 40 years, Avolites equipment has been found surviving the mud in each corner of the Worthy Farm takeover. This year the British manufacturer’s consoles and media servers were not only used on the main stages such as the Pyramid, which was also powered by Avolites ART2000 dimmers, the Other, John Peel, West Holts and the Acoustic Stage but also Arcadia Spectacular and The Temple immersive dance environments, and after hours areas such as the Unfairground art field. Lighting Designer Andrew Liddle, whose recent portfolio includes OMD, The Charlatans and La Roux, has been working with Avolites consoles for the past 35 years. Like Avolites, Liddle is a Glastonbury stalwart, hitting the festival for the 16th year running – this time with indie dance legends New Order. With a performance of ‘atmospheric magic’ that impressed NME magazine, the Manchester-born group took to the Other Stage in support of their latest album Music Complete. Liddle augmented the Other Stage’s house rig with 24 Clay Paky Sharpys, four Martin Professional MAC Vipers and six ETC Source 4’s, controlling the set up with an Avolites Arena, supplied by technical event production house Hawthorn. Performing on the John Peel stage was Brighton’s DJ legend Fat Boy Slim, with long-time lighting designer Stephen Abbiss creating the ultimate rave atmosphere for the raucous crowd that packed the tent. Abbiss transferred the show file from his own powerful Titan Mobile, which he uses for some of his biggest shows, to a Tiger Touch II running Titan v10. Also on the John Peel Stage, Tom Campbell of TC Lighting Design was also operating an Avolites Tiger Touch II to control his design for John Grant; whose performance received a great review from The Guardian despite the American singer-songwriter suffering from flu. Campbell, who is also currently out on tour with Welsh rockers Bullet For My Valentine, has been using Avolites for a decade. “I have always been a big fan of the speed and ease of programming on Avolites consoles – it’s incredibly useful,” he said. 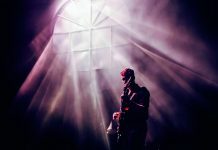 As John Grant captivated the audience with his heart-wrenching back catalogue, Campbell complemented the performance with a series of retro-esque lighting looks, cleverly using LED technology disguised as classic tungsten fixtures. His design is also based around a rear ‘analog’ video wall, constructed using eight rear set pieces made out of metal gauze, ranging in height from 12ft – 20ft, depending on the venue. These are used to create a range of spectacular three-dimensional visual looks for the band to perform in, which Campbell triggers from the Tiger Touch II. Moving across to the West Holts Stage, lighting designer John Rogers chose a compact yet powerful Avolites Quartz console to control his design for soulful funk group Quantic All Stars. “The compact design of the Quartz makes it really festival friendly,” says Rogers. “However its small size is deceiving – one of the house techs of the West Holts Stage was really impressed that such a compact desk could take 15 universes in its stride. It definitely made a good impression. Also important to Rogers was the ability to transition his original show file over to the Quartz from a Tiger Touch II running version 9. Rogers’ festival tour design for the Quantic All Stars is energetic and bold, utilising Robe Pointes’ striking beam and prism looks to create a strong party vibe that runs through the set. Another seasoned Avolites user, LD Ken Coker operated a Sapphire Touch – the Acoustic Stage’s house desk supplied by Rob Sangwell at Fineline Lighting – for Barclay James Harvest. Interestingly, the progressive rock group were the first band to take Avolites’ original equipment on tour in the 1980s. Coker applied the house rig including Robe and Martin Professional fixtures to ensure frontman John Lees was perfectly lit at all times, whilst also creating myriad textures with gobo work and subtle beam looks. Like Abbiss, Coker is impressed with Titan v10’s customisable windows, applying the feature to boost the efficiency of his programming for the quick festival turnaround. As ever there was plenty of Avolites action on the incredible Arcadia Spectacular, who brought back their stunning Metamorphosis show to the festival for the second year running. Two Sapphire Touch consoles worked as the main and back up lighting desks, with a Quartz used to control SFX. A single Ai Infinity RX8 media server with eight outputs powered the incredible visuals for the entire set up, with a back up in place. This meant there was only one machine live at a time running the interface, plus seven outputs going out to external devices – six projectors and one LED processor. In addition, two Infinity R8 servers, one main and one back-up, ran video content on The Temple Stage. Avolites Ai expert Arran Rothwell-Eyre set up and operated the system, alongside top visiting VJs. BPM undertook special effects duties for two highly anticipated performances at this year’s festival. Dance pop trio Years & Years played on The Other Stage and enjoyed stadium shots with a rainbow confetti effect – comprising one block colour per stadium shot. Elsewhere, on the Pyramid Stage, Ellie Goulding played an early evening set on the final day of the festival. After completing her Delirium tour in the UK and Ireland, Goulding returned to British shores for a festival run. Her Glastonbury production on the main stage boasted CO2 Jets, XL Confetti Megashooters with multi coloured confetti and pink and white balloons. 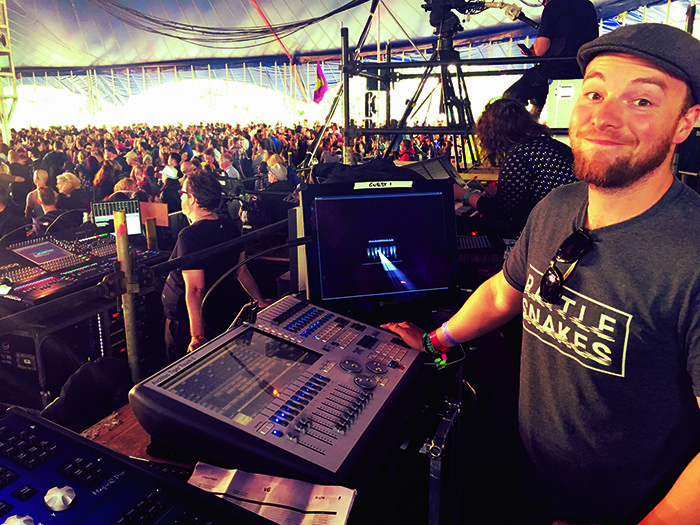 DiGiCo’s Mark Saunders and Tom Williams were on site at Glastonbury, supporting DiGiCo engineers, rental companies and broadcasters across the site over the weekend as and when required. The pair worked closely with South West Group Events, which had recently purchased two DiGiCo S21’s with D2 Stage Racks. These were used at the monitor and FOH positions on the BBC Introducing Stage with an SD10 used at FOH on The Park stage. 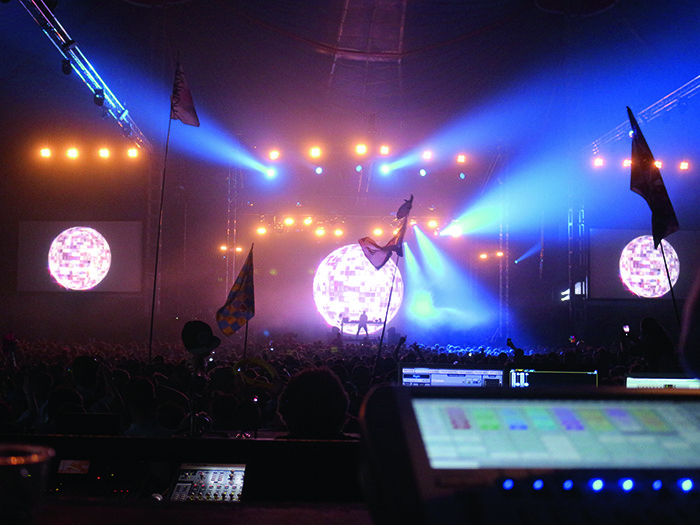 Incoming acts that used DiGiCo consoles on the major stages included Adele, Coldplay and Jeff Lynne’s ELO – all of whom used SD7’s FOH and monitors. New Order used SD5’s at FOH and monitors, while Daughter chose SD10’s. LCD Soundsystem used an SD5 at FOH, M83 selected an SD10 monitors, James Blake had an SD11 at monitors and for Years & Years it was an SD10-24 at FOH. Quantum Special Effects provided confetti, streamers, and pyrotechnics for three major headline acts at the festival. 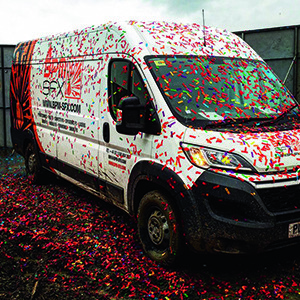 Battling against pouring rain and mud that threatened to swallow flight cases, the Melksham-based company was proud to have survived and serviced its biggest Glastonbury festival to date. With trends in special effects rapidly becoming a staple of festival entertainment, the Quantum team were called upon to supply bespoke visuals for Foals, Muse, and Adele on both Friday and Saturday night. In close collaboration with the individual production teams, Quantum worked tirelessly over the weekend to ensure each act had its own stand-out programme of effects to entertain the crowds. Starting with Foals on Friday night, Quantum provided 30kg of white confetti alongside four stadium shots of white and blue streamers for the band’s finale song Two Step, Twice. In a rare moment of clear skies, the biodegradable paper flew into the air above a perfectly arranged sunset backdrop. Closing the evening were returning headliners Muse, who became the first act in Glastonbury history to have topped the bill on all three nights of the festival. Quantum has worked with Muse on many of their previous tours and was confident in maintaining the band’s reputation for an outstanding live performance. A dazzling combination of comets and mines were fired from the towers either side of the stage for song Globalist, while anthem Mercy saw 84kg of custom ‘drone’ shaped confetti pour into the audience. For the final touch, 12 stadium shots were wirelessly programmed to release 132kg of streamers that matched the colours of the on stage visuals, arcing over the crowd in an epic display of red, pink, purple, yellow, and blue. For their final contribution, Quantum surprised crowds with a 25ft pyrotechnic waterfall for song Set Fire to the Rain. Lasting for 30 seconds, the effect lit up the entire stage bringing the infamous song lyrics to life for the whole audience to see. All of Quantum’s work was fuelled by expert gas suppliers and sister company, Gassed Up. This year, Operations Coordinator Claire Webb organised the CO2 for all of Glastonbury’s headliners including 56 individual canisters for Adele’s bespoke confetti launch, as well as Tame Impala’s debut Pyramid set and Coldplay’s big Sunday finale.